This release has an International sound mixing Afrobeats/Afropop, Caribbean and Western Pop. This anticipated record is released by Ms.Bodega’s Record Label, Bodega World Music and Young D’s own Mder Beatz. STAMINA INTERNATIONAL REMIX OFFICIAL MUSIC VIDEO has already been shot in NYC and will be ready for release next week. 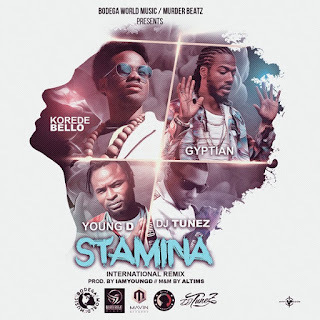 Korede Bello, Gyptian, Young D and DJ Tunez are all in the video. Elements of Afrobeats and Caribbean culture and fashion are included in the the video. It was directed by Nigerian Super Director Wole Ogundare/Blaze Productionz and Produced by Ms.Bodega/Bodega World Productions.